Cerebral Overwriter can be advanced. 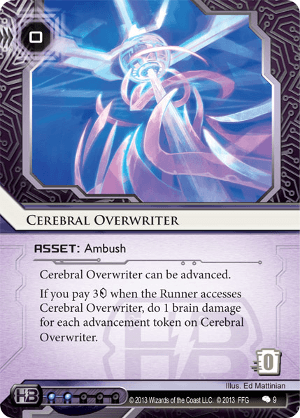 If you pay 3credit when the Runner accesses Cerebral Overwriter, do 1 brain damage for each advancement token on Cerebral Overwriter. Very similar to Jinteki's Project Junebug in terms of installation Edge of World in terms of payload. Trick of Light: As a part of a fast advance strategy if the runner isn't biting this combo will allow those advancement tokens to be moved to an agenda, perhaps even opening a scoring window to score 3/2 agendas such as Project Vitruvius or Accelerated Beta Test out of hand in one turn. With enough brain damage flat-line strategies that use cards such as Scorched Earth become more viable. Jump start Cerebral Overwriter by installing in combo with Mushin No Shin perhaps install with some protective ice to make it suspiciously look like an agenda about to be scored, if the runner bites, corp gets to smile. Recur Cerebral Overwriter with cards like Archived Memories, Architect an overscored Project Vitruvius etc to give this card even more action. 0 cost means it'll only surprise the runner once. There is nothing new or novel about this card that we haven't seen in other cards. It continues to go along with HB's preference towards brain damage and so it is at home in many HB, Jinteki & even some Weyland decks (sorry NBN this card probably isn't really going to be your thing.) Maybe a bit expensive at two influence points which is why it is often looked over in favor of Aggressive Secretary which for the same costs could wipe out an entire rig for the runner which is often a more sure-fire strategy for discouraging the runner than a little brain damage. --It just saddens me when I see cards with no reviews. If you appreciated this review, please give a heart and I'll be encouraged to write more.